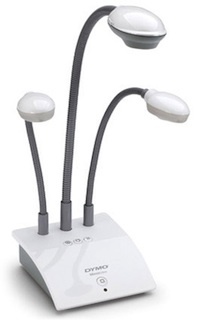 The MimioView document camera is part of the MimioClassroom suite that shipped this month. DYMO/Mimio has launched its new interactive classroom suite, MimioClassroom, including a new system called MimioTeach that turns a regular whiteboard into an interactive input device. MimioClassroom is an integrated suite of classroom learning and assessment tools that combines polling, capture, and control hardware with a device that's designed to transform whiteboards into interactive whiteboards. Included in the suite are five individual components. MimioTeach, scheduled to ship next month, is a compact sensor bar that attaches magnetically to a whiteboard to turn it into a stylus-based interactive system. It communicates with computers and projectors to create a complete interactive whiteboard experience. MimioTeach is an upgrade to DYMO's Mimio Interactive Xi system, adding an ergonomic, rechargeable stylus and automatic pairing with the wireless hub. MimioCapture is a four-color, rechargeable electronic market set that allows teachers to capture everything drawn or written on the interactive whiteboard, with the ability to convert handwriting to live text for editing and saving. Notes and drawings can be saved as images in JPEG format or documents in HTML and PDF formats. MimioVote is a classroom response system that communicates with a USB-based receiver to allow students to participate in polls and assessments. Feedback can be displayed instantly, and results can be downloaded via spreadsheet, with the option to chart responses on the fly. It also supports Microsoft PowerPoint. MimioVote includes 24 or 32 handsets. MimioView is a gooseneck-style document camera that allows users to capture video and still images (up to 1,600 x 1,200 native resolution). It provides a 5.5x optical and 16x digital zoom, automatic focus and color balance, dual LED lamps, and a microscope adapter. Finally, the MimioPad is a wireless, stylus-based tablet that provides control over the whiteboard (writing, pointing, and clicking) from up to 30 feet away. Most of the individual components of the MimioClassroom suite began shipping this month. MimioView sells for $599; MimioPad and MimioCapture sell for $299 each. MimioVote is available in configurations of 24 units ($1,699) and 32 units ($1,899). The MimioTeach interactive system will ship in November for $799. A preorder deal on MimioTeach is available now through Oct. 31.